Quibors Promotions starts with fireworks its 2019 fighting season with Double Rumble in Bacoor Part 10, an exciting boxing show set to thrill fans Saturday January 26 @ Bacoor City Hall Strike Gym, Cavite. Produced with the support of the City Government of Bacoor, the main event features tough Zamboangueño southpaw Charlie Malupangue (7-3-3, 6 KO's) of the Kyru Boxing Stable battling unbeaten young Warai Warrior ArAr "Asero" Andales (8-0, 1 KO) of the Quibors Gym for the vacant WBA Asia Minimumweight (105 pounds) Title. The 26 year-old Malupangue -- who comes from winning his two 2018 fights by way of knock out -- bets that the power of his punches will reduce the stamina of the speedy Andales. However, while it might be true that Malupangue delivers more damaging, solid blows, it is also true that Andales is a boxer of good boxing skills, sharp left jab and quick defensive moves. So who will prevail, the tough power puncher... or the fast tactical fighter? This war is a 10-rounder and you have be there! Warai Warior ArAr Asero Andales with manager Orlando Borcelango. Andales Will Battle for WBA Asia Belt Jan 26 in Bacoor. 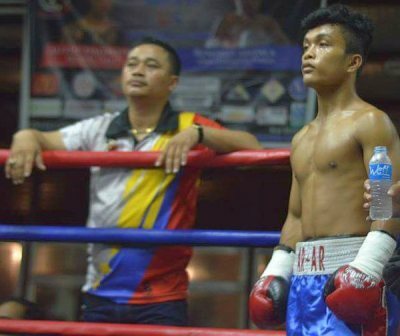 In the co-feature, dangerous heavily-tattooed Alphoe Dagayloan (11-2-5, 5 KO's), the man who last July went to Russia to knock out the local fighter there, now targets 19 year-old Boholano heavy-bomber Danrick Sumabong (7-1, 6 KO's) of the Harada Boxing Gym in Tagbilaran. This 12-rounder collision for the vacant WBA Asia Flyweight (112 pound) strap is a well matched-up rumble that promises you total non-stop action. In featherweights, 20 year-old Quibors fighter Rustom Doronio (4-1, 3 KO's) engages Zamboangueño southpaw Harison Caba (4-0, 3 KO's) of the popular Dino Olivetti Boxing Gym in Biñan City, Laguna, in an intriguing very good match-up. Moreover, veteran super flyweight Jopher Marayan (7-12-2, 3 KO's) of the Quibors Stable takes on less-experienced Berwela Gym warrior Mark Jequinto (2-2-1, 0 KO's) of Sucat, Parañaque, Metro Manila. Plus, fearless Anthony Pansu of the Winners Boxing Stable in Calumpit Bulacan wages his first fight as a pro fighter against Ron Mitra (1-0-1, 1 KO) of the Quibors Gym in a four-rounder in the super flyweight division, and May the Best Man Win. 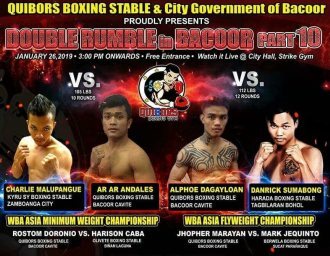 Double Rumble in Bacoor Part 10 @ Bacoor City Hall Strike Gym is an effort of promoter Joseph Quibral of Quibors Boxing in association with Mindoro Oriental promoter Gerry Balmes and in cooperation with manager Orlando Borcelango and matchmakers Jimmy Vallares Jr.
Fights start @ 3 PM. The author Carlos Costa is a veteran fight reporter living in Cebu. Carlos can be reached by email: carlos512@hotmail.com or whatsapp 09184538152.